Deputy Secretary of State John Sullivan on Monday participated in a global LGBTI rights conference that took place in the Canadian city of Vancouver. The Equal Rights Coalition, which officially launched in 2016, seeks to advance LGBTI rights around the world. Canada and Chile currently co-chair the coalition that includes the U.S. and 38 other countries. Deputy Assistant Secretary of State for the Bureau of Democracy, Human Rights and Labor Scott Busby; Deputy Assistant Attorney General Robert Moossy; Anthony Cotton of the U.S. Agency for International Development and three other State Department officials attended the conference. Hundreds of LGBTI rights advocates from the U.S. and around the world were also in Vancouver. Canadian Foreign Affairs Minister Chrystia Freeland also spoke at the two-day conference that began on Monday. The conference began a day after Canadian Prime Minister Justin Trudeau marched in Vancouver’s annual Pride parade. Trudeau last November formally apologized to those who suffered persecution and discrimination under Canada’s anti-LGBTI laws and policies. LGBTI activists and members of Canada’s indigenous community are urging the Canadian government to do more to further address abuses committed against them. Canadian MP Randy Boissonnault, who advises Trudeau on LGBTI issues, on Tuesday announced his government will earmark 1 million Canadian dollars ($765,828.70) for advocacy groups around the world. The Canadian government late last week urged Saudi Arabia to release women’s rights activists who were arrested. 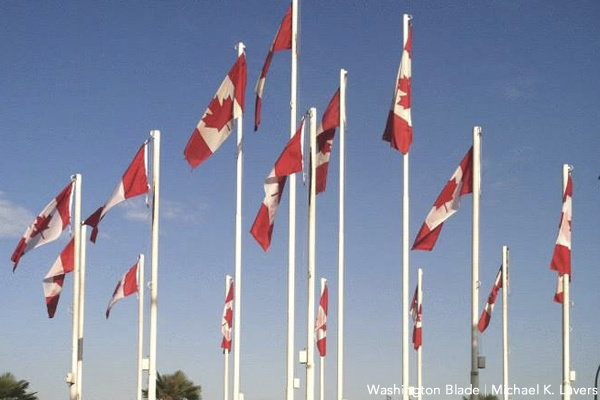 The Saudi government on Monday announced the expulsion of Canada’s ambassador to the country and suspended new trade agreements with Ottawa. The Trump administration continues to face criticism over a host of issues that include its anti-LGBTI policies in the U.S., its policy that effectively bans the citizens of five Muslim-majority nations from entering the U.S. and the continued separation of migrant children from their parents. The State Department nevertheless continues to publicly support LGBTI rights abroad.